Juggling the demands of work, spouse, children, pets, and leisure time for yourself can be difficult enough to manage, but add the responsibility of caring for a senior parent and you are burning the candle at both ends. It is estimated that one out of every three caregivers works outside of their home. More than half of the caregivers working outside their home are full-time, 16% work between 30-39 hours, and 25% work part-time. If you are working and providing care for an older parent, you are most likely sacrificing your free time, your work may be suffering, and the stress can be detrimental to your own health. Get Organized. The tasks that you do for your family member may have grown to a point that is too overwhelming for you to handle. Write a list of all the things that you do for them – grocery shopping, cooking, cleaning, driving to medical appointments, home maintenance, personal care, etc. Along with the tasks, add the time of day or week these need to be done. Informal Care. There may be tasks on this list that can be done by other family members, friends, neighbors, church members, or local volunteers. Contact your local senior center to see what resources might be available to assist you. In-Home Care. If the care that you are providing is medical or personal care, such as bathing or toileting, you may need to pay for in-home care. You will feel more confident with a trained professional who is competent. Check their references carefully. Residential Care. Is your list so long that clearly your mom should no longer be living on her own? 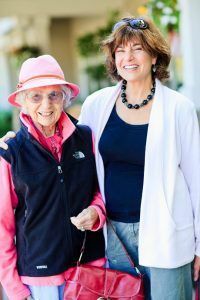 If you cannot provide the consistent support she needs and she is no longer safe in her home, you need to consider an assisted living community to meet her care needs. Many seniors at home are isolated and lonely, an assisted living community can also provide social connections which will help them thrive. Talk with Your Employer. Having an honest conversation about the demands of your personal life can be difficult. But keep in mind, many employers offer flexible work hours, work from home options, and family leave time to care for an older adult. Give your employer the opportunity to help work with you through this transition. At Aegis Living, we are here to help. Contact a local community to schedule a tour and find a solution that is right for your family.